The eye withdrew, and the guards held a whispered conversation. "He called me an in-thingy. What's that mean? Well, yes he also called me a moron, so I guess it doesn't matter, but should I be offended? I mean, he is a Magician. Yes, I know the boss said magic can't pass this door, but it wouldn't be the first time the boss forgot to tell us something. You can talk—you won't be the one turned into a toad if this door doesn't work." The whisper ended with a growl and the eye reappeared. "Right. This door is magic-proof, so save your breath and don't bother making me into anything unsavoury. And I'm not offended that you called me a whatever-it-was. You said 'no'. Boss said you'd say that and to give you an encouragement to change your mind. So here it is!" The bolts withdrew with a shriek and the two overweight guards threw Harm through the doorway. Montague rushed forward before Harm hit the floor, but found again that a five-foot-nothing Magician cannot lend much physical aid to a three-hundred-pound Legend. The gaolers didn't laugh as Harm collapsed on top of the Montague and drove him to his knees. They were too busy dragging the door closed, thrusting home the bolt, and pulling the key from the lock. Then the guards yelled in malicious glee, extra loud for his benefit. Montague kept his silence until the laughter faded in the distance. "You're a tad heavy, old friend. Any chance of some help?" As though awaiting the question, life returned to the massive limbs. Review: This book was a really a trip out of my comfort zone. I don't usually read fantasy, but this story sounded interesting. I had a hard time getting into the book at first, but the writing style reminded me of Terry Pratchett's Discworld a little bit. There was a lot of humor and a lot of running, which also reminded me a bit of Doctor Who. The humor is what really kept me reading. I liked the banter between Montague and Loom, though its not the typical banter because Loom is a mute. Harm was a bit more philosophical in his discussions. When he wears the Helmet he's able to become a fierce fighter who doesn't remember anything about the battles once they are finished. Nolson is another fabulous character who may just be more than he seems, especially after he puts on the Helmet trying to keep it from being lost. This is a story of a group of warriors that are fighting there way around the world (?) liberating villages on the way and making some money to keep the fight going. There's some magic and some hints of dreams and church organs. Once you get about half way through, the story starts to make more sense, but to explain why would give away what is really going on, or what you think is going on, because even though I had an idea there wasn't anything really revealed even at the end. Speaking of the ending, it was totally not what I was expecting. 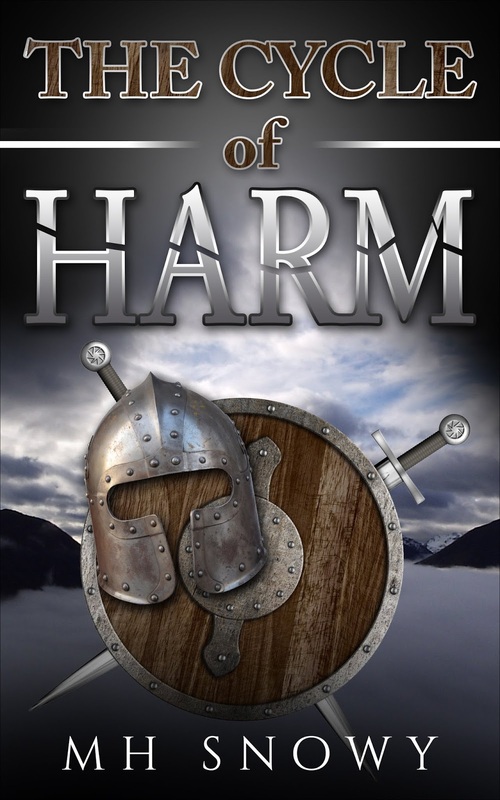 If you are looking to try something in the fantasy genre, this is a great book to start with. 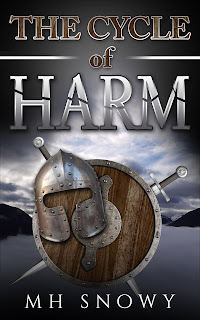 Melindra Hattfield Snowy, a part-time writer and full-time dreamer, who of course prefers to be known as MH, has penned The Cycle of Harm. She is also the author of the first three adventures of The 12 Nights of Jeremy Sunson, which are collected in her first novel, The Nights Too Dark, described as chock-full of fun where the end of the world meets Groundhog Day. You can find MH at www.MHSnowy.com, on Goodreads, and you can follow @MHSnowy_Dreamer on Twitter. MH Snowy will be awarding a $20 Amazon/BN GC to a randomly drawn winner via rafflecopter during the tour. Hi, thanks for hosting, and thanks for the review. No higher complement than that you enjoyed the humour in an unusual genre! Hi James, thanks for following the tour. Hi Victoria, I thought the review was well-written too.